New Internet threats and attack techniques are emerging every day. Networks, websites, databases, applications and end users are under constant attack as cybercriminals relentlessly target information systems to steal data that can be used for financial gain. At the same time, with limited and maybe even dwindling resources, organizations are under pressure to maintain compliance with growing industry and regulatory mandates, while increasing service levels and delivering strategic projects that will grow the business. 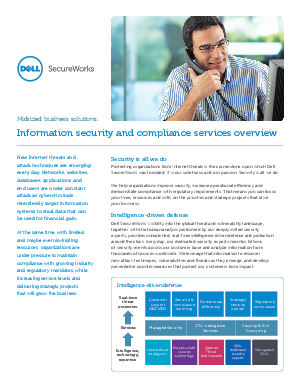 Read this whitepaper to understand how Dell SecureWorks can help your midsize organization improve security, increase operational efficiency and demonstrate compliance with regulatory requirements, allowing you to focus on the priorities and strategic projects that drive your business. Let Dell SecureWorks’ visibility into the global threat and vulnerability landscape and deeply skilled security experts provide your company with unmatched real-time intelligence-driven defense and protection around the clock.